MJR can personalize engagement rings, wedding rings or all of your fine jewelry & watch items with the distinct touch of engraving. This is a great way to make them personal and unique. Most rings, flat surfaces and watch case backs can be engraved. 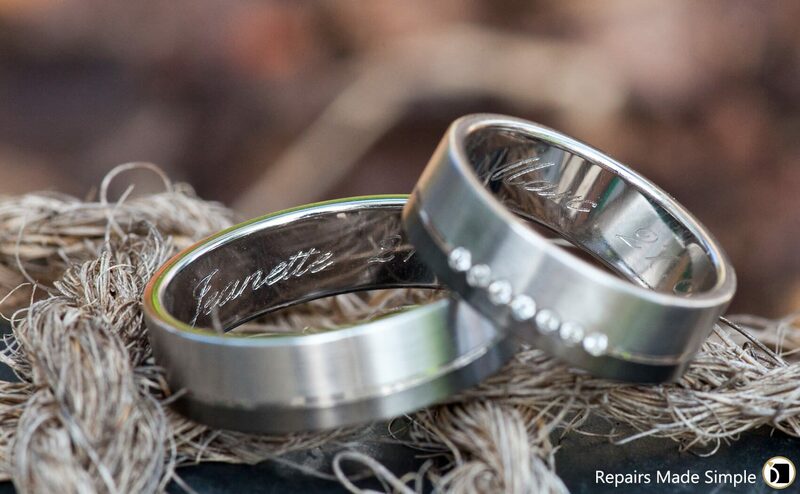 Engraving offers endless possibilities, and instantly creates sentimental value to the recipient. The most common engraving fonts are: Slant Script, Script, Roman, Helvetica, Contemporary, Clarendon, Victoria, and Fifth Avenue. MJR also offers hand engraving upon request. There are many reasons to engrave an item, and many different messages and feelings that can be expressed through an engraving. The message can be heart-felt, serious, or humorous, but most importantly personal. Many engravings also include the date of a special occasion, for example an engagement date, a wedding date, a graduation date, or a birthday. Engravings can also include a symbol like a heart or a smiley face. – You did it!, Way to go!, Congratulations! – Love You Mom, Best Mom Ever!, #1 Mom, Thanks Mom! And you can also engrave quotes, faith based messages, or even just a name or nick name.